The brand-new Toyota C-HR is the latest entry in the venerable subcompact SUV market. Toyota debuts the "Coupe High Rider" in 2018, emphasizing the numerous exterior features all designed to impress even the most discerning auto enthusiasts. The edgy and stylish design of the 2018 Toyota C-HR is set off by its standard vortex-styled 18-inch alloy wheels. Standard in every C-HR are halogen headlights and the accompanying cluster LED Daytime Running Lights with stylish taillights, giving the SUV a masterfully distinct look. The Toyota experts at Nelson Toyota in Stanleytown, VA couldn't be more excited to show off the new 2018 Toyota C-HR. Our friendly and professional sales associates are eager to answer any questions you might have while we hit the road and take you out for a test drive. We look forward to serving you today while we demonstrate all of the unique features of this fun subcompact SUV. 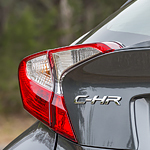 See Our Toyota C-HR Inventory!